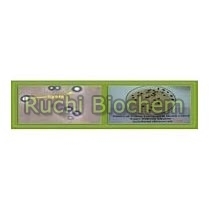 We provide Azotobacter that is a Nitrogen fixing Bacteria for all non â��leguminous crops. Azotobacter contains 109/gm spores of Azotobacter species. This microorganism fixes the atmospheric nitrogen and makes it available to plants in a symbiotic manner. Azotobacter is mainly useful for monocot vegetables. Azotobacter also secretes some fungicides, enzymes but in minute amount. The use of Azotobacter increases the crop production in large scale. Use for the non-leguminous crops before the mentioned expiry date. If the seed is to be treated with pesticides; first follow the pesticide treatments and finally treat seeds with Azotobacter inoculant. Use 15 to 20 gm / kg of seed, 1 to 2 kg for soil application per acre of land, 1 kg for root application (root dipping) of one acre of crop. Jowar, Bajra, Wheat, Maize, Paddy, Cotton, Sugarcane Vegetables, Grass, Fruit trees and Ornamental plants. 500 gms / 500 ml, 1000 gms / 1000 ml.